DWI has expanded its applications outside the brain in the last years because of technological improvements in gradient strengths and sequences. Nowadays, DWI forms part of “state-of-the-art” liver MRI protocols, although lack of standardization limits its widespread use. In this chapter, we analyze the main technical parameters of DWI of the liver in order to choose the most appropriate type of sequence according to the magnet and patient status. The characteristics on DWI of focal and diffuse liver disease are also summarized, outlining the currently established and potential clinical applications of this functional technique. DWI is probably the best noninvasive imaging test for detection of focal liver lesions using black-blood DWI sequences with low b values. 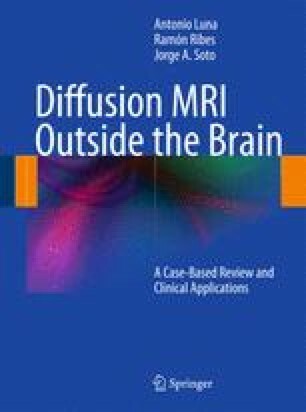 DWI may help along with other MRI sequences in focal liver characterization. As in other organs, the potential of DWI in post-treatment monitorization and prediction of response to treatment have not been fully explored, with recent data supporting a growing role in this task. Besides, the role of this functional technique in diffuse liver disease is currently under evaluation.